Washington - Raising beef for the American dinner table does far more damage to the environment than producing pork, poultry, eggs or dairy, a new study says. Compared with the other animal proteins, beef produces five times more heat-trapping gases per calorie, puts out six times as much water-polluting nitrogen, takes 11 times more water for irrigation and uses 28 times the land, according to the study published Monday in the journal Proceedings of the National Academy of Sciences. Cows are not efficient at converting feed to protein for human consumption, said lead author Gidon Eshel, an environmental physics professor at Bard College in New York. Eshel used U.S. government figures to calculate air and water emissions and how much water and land were used in the lifetime production of beef, pork, poultry, dairy and eggs. While other studies have looked at the issue, this is one of the most comprehensive pieces of research quantifying and comparing the U.S. environmental costs of different meats and other animal protein. Adams said that the beef industry has improved its environmental sustainability in recent years and that the U.S. produces beef with the lowest greenhouse gas emissions of any country. In the study, pork, poultry, dairy and eggs all had comparable environmental footprints, so close there were no statistically significant differences among them, Eshel said. But cows were off-the-chart different. The study did not look at plants or fish raised for human consumption. Cows burp major amounts of methane, a greenhouse gas that is dozens of times more potent than carbon dioxide. Their digestive system makes them produce considerably more methane than pigs, chickens or turkeys do, Eshel said. The manure used to grow feed for cows also releases methane, as does their own bodily waste. Because they are bigger and take longer to put on weight for meat, cows eat more food over their lifetimes than other animals raised for protein. Nitrogen, from fertilizer runoff, can harm rivers, lakes and bays, causing oxygen-depleted “dead zones.” The use of irrigation water is a major issue out West when there are droughts, like the current one in California. So much land used for farming changes the biodiversity of a location, Eshel said. “It really looks like beef is a lot worse environmentally than these other meats,” said Ken Caldeira, an environmental scientist at the Carnegie Institution for Science. Caldeira wasn’t part of this study, but has a separate study of beef’s greenhouse gas footprint around the world, published this month in the journal Climatic Change. Eshel calculates that the average American who switches from beef to pork would reduce the equivalent of 1,200 pounds of carbon dioxide a year, which is about nine days’ worth of the nation’s per capita greenhouse gas emissions. The EPA calculates that it is the same as the emissions from 61 gallons of gas or what comes out of the smokestack from burning 580 pounds of coal. Even though pigs have the reputation for being dirty, the data shows that they “come out pretty clean” when compared to cows, Eshel said. The message from the study is “whenever possible try to replace beef with other sources of protein from animal sources,” said Eshel, who said he doesn’t eat meat now but used to raise cattle on a kibbutz in Israel. Nutrition scientists Marion Nestle at New York University and Malden Nesheim at Cornell University said the study makes sense, was done carefully and is important. Caldeira, whose study examined livestock and greenhouse gas internationally, found that livestock accounted for 9 percent of the world’s total greenhouse gases, and their overall output has increased 51 percent since 1961. 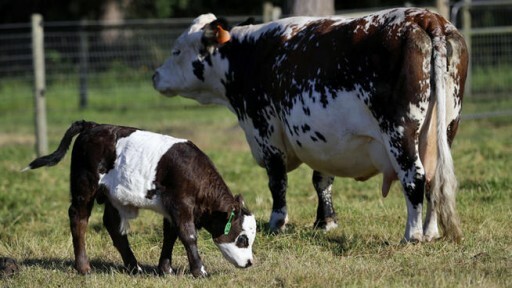 He also found that the developed world - including the U.S. - decreased its carbon emissions from livestock by 23 percent, while the developing world has more than doubled its emissions in that category. So overall greenhouse gases from livestock rose by more than 50 percent. Countries like the United States are importing beef from developing countries, potentially skewing the results, Eshel said. Is this all a bunch of bull? I think that living in America is hazardous to the brain; more American believe that crap is truth.